Louise recently contacted our Innovation Centre after seeing a post on our Facebook page about the spinning pod chairs that the team had created. She knew one would be perfect for her son, 11 year old Curtis who has Charge Syndrome. She told us their story. Curtis has Charge Syndrome which affects him in lots of different ways. It affects his development, meaning that he can’t walk and talk and he also has many sensory issues. He is partially sighted and has a cochlea implant because he is partially deaf. He is unable to tell where his body is in space and because of this, he has balance issues. Longer term, Curtis has heart and lung problems and is on long term ventilation after needing a tracheotomy. He has night carers who have been a big help as Curtis isn’t a good sleeper, although he goes through patterns with his sleep and it has been helped with medication. Curtis craves constant sensory input which means that he often gets frustrated and can lash out. His 4 year old brother Oscar is great with Curtis but it can be difficult for him, especially if Curtis is having a bad day. For a while now, I have been looking for something to help Curtis to feel more grounded. We had a very old spinning chair that Curtis would spin on all day if he could because he doesn’t get dizzy but as he was getting older, the chair was getting less safe for him to use and I was worried it would break. Then I saw pictures of the spinning pod chair that the Cerebra Innovation Centre had created on Facebook and knew it would be perfect for Curtis! 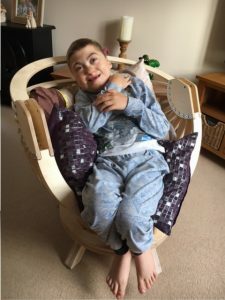 I contacted the team and the day the chair arrived, Curtis was absolutely over the moon with it! 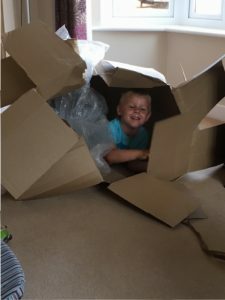 Oscar even loved the box that it came in! The pod now makes up an important part of Curtis’ day. He can touch the floor and spin himself which gives him some independence and it also grounds him so the benefits have been huge. The Innovation Centre have been great. A lot of things are designed for younger children and often there’s not a lot available for older children but they helped to fill in the gaps. There are so many challenges we face and it’s nice to know there’s someone there to help. You can find out more information about the Cerebra Innovation Centre on our website. If you would like to find out how you can get a spinning pod like Curtis’s, contact the team at [email protected]. Hi Julie, thanks for your comment. They’re not available to purchase but if you contact our Innovation Centre at [email protected] they will be able to advise you on how you can get one that is suitable for your needs. My son loves spinning. How would I go about getting one? Thanks for getting in touch Elaine. If you drop our Innovation Centre an email at [email protected] they will be able to help! Your innovation centre is amazing! I am hoping that they can create a portable, supportive, wipe clean, toilet seat so my son can use his skills to poop on a toilet when we are out and about. This would be life changing for many. Keep up the great work Cerebra! Thank you so much for your kind words Joanne! Have you been in touch with our Innovation Centre about this yet? I’m sure they would love to work with you on this. If you haven’t already, drop them them a line at [email protected]. I’d love to hear how you get on too! My email address is [email protected]. I am interested in your spinning pod for my 9 year old severely brain damaged god daughter – she has severe cerebral palsy and no vision. Could you please give me an idea of whether this might be an option, whether you can lend for a trial period and how much it costs to buy? Hi June, thank you for your comment. The team at our Innovation Centre would be able to answer any queries you have about the spinning pod and will be able to tell you if it might be suitable. You can contact them at [email protected].